Hi Guest. I am new to K100's and posts like yours are brilliant. I very much like your late evening light shot you posted Sat Oct 08, 2011 9:26 am. I know this is off topic but, can you please tell me what seat that is, as it looks a bit lower and more stream lined than my standard "seat bench". I am a bit on the short side and your seat looks like it might be the answer! Your info would great! G'day Weeble , I'm pretty sure the seat is a Corbin ( Canyon Dual Sport ) , I've got the same on my bike , not sure if it's going to help you get a better foot hold , the seat is much wider than stock so it tends to cut in on the back of your leg when you put your foot down having said that it's great on the move . I've just noticed this post...pardon, the forum didn't 'inform' me via email since I probably didn't follow up on a few posts previously. It is a Corbin Canyon Dual Sport in leather, very hard, but comfortable over the road on long and short trips, but too 'tall' for me in that it doesn't allow me to slide all the way back...ideal for a 6+ footer but not a 5' 9" soul. I get my feet to the ground flat, though it has a slight rise to it where the legs would naturally fall, but otherwise no worries. I wouldn't buy a Corbin unless I went to Hollister, California and had them make it to my preferences. I've now got abut 17,000 kilometres on those tyres and wheels from last October and they're just now wearing flat in the back and mildly 'scalloping' in the front - a reflection more on the sharp camber of our roads than the tyre's design. This weekend I removed the 2mm spacer to allow the tyre to sit closer to the swingarm. I filed off an area 1.5mm deep and about 30mm long of the reinforcement rib on the inside of the swingarm to allow the tyre to clear better and to give it less of an offset - not a handling issue but someone commented on it being off to one side so I thought I'd see what I could do to rectify it. Shifting the tyre to the right a few mm more changed nothing as far as roadholding or cornering goes. (mildly 'scalloping' in the front ) isnt that a sign of an under inflated trye? 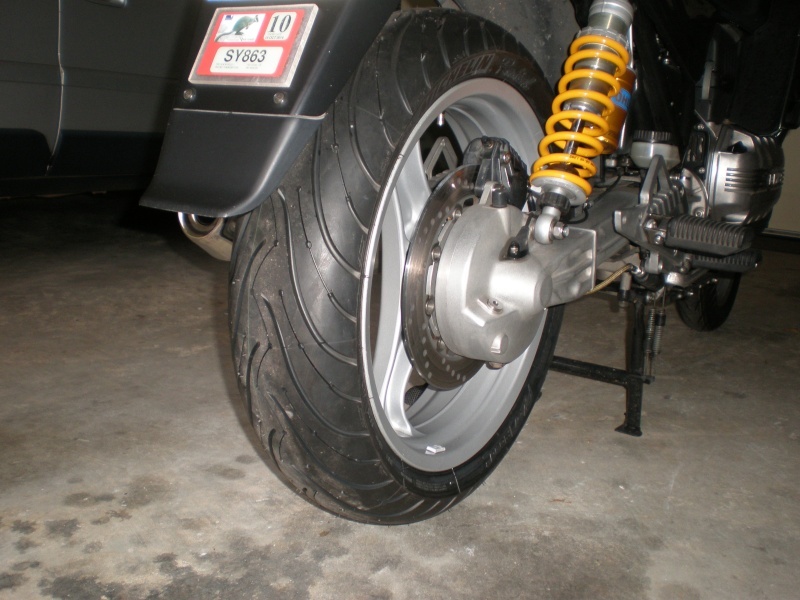 I know the significance of the wheel/tyre changes brought upon your bike but doesn't it indicate that maybe you can go up a couple of pounds in the front tyre? 38psi minimum front on up to 42psi when heat, speed and/or load are a factor. Bad scalloping is a sign of underinflation. I use a tyre pressure gauge regularly. Yup , agree totally with G I T H ( about the corbin ) I'm south of 5' 9" and I find that my bum is way forward as well so I'm not taking advantage of the corbin shape as much , I'm due for a seat re-cover & as such have decided to re-do the original seat and move the corbin along , interesting that you filed off some of the rib on the monolever , I was thinking of doing the same , do you still need to take some off the left foot of the centre stand ? Keep me in mind if you do sell please. Thank you JR_K100RS and Guest in the House for the info re that seat. At 5'5" I don't think thats the seat for me. I have taken a carving knife to my standard "bench seat" and lowered it about 25 to 30mm. Feels much better and lower centre of gravity seems to help handling too. 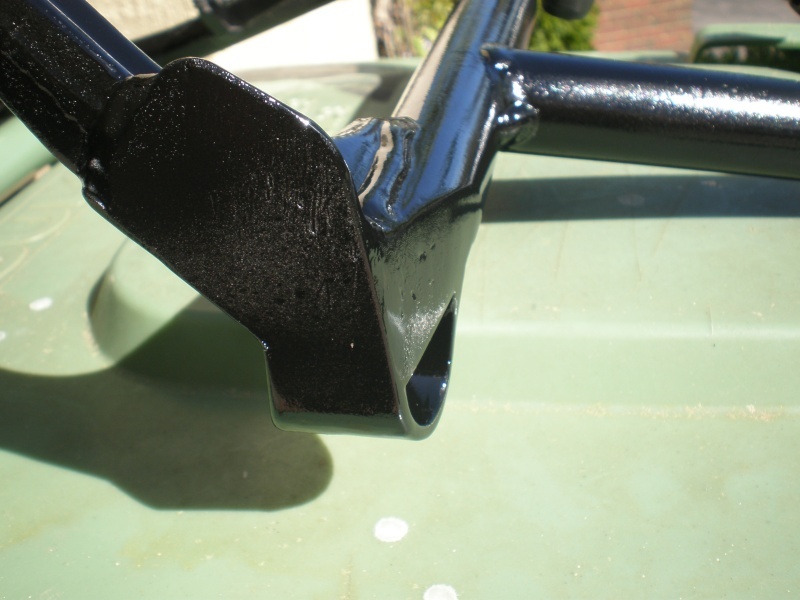 The only problem is the finish to the seat is a bit rough. Never tried it before. I'll live with it 'till I can find that rare BM Sliding Seat. 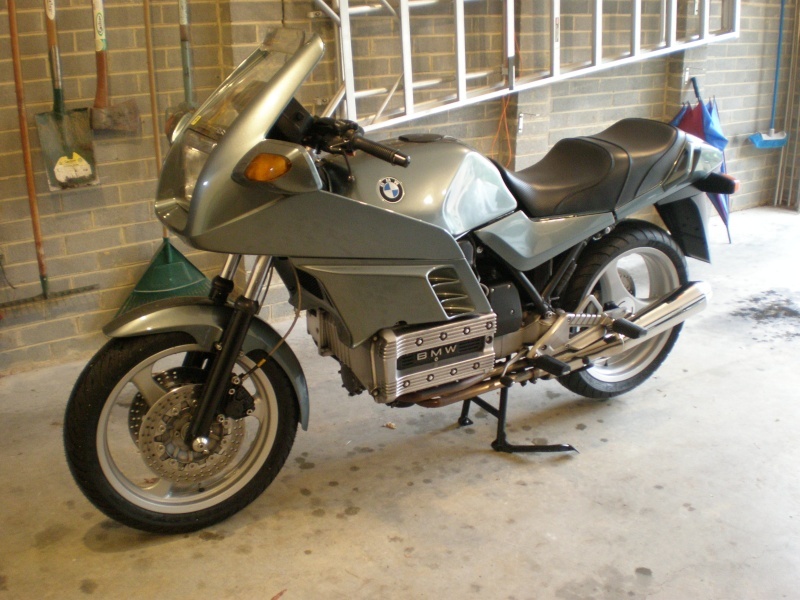 1990, K100RS, 16v. As pictured left (my avatar). 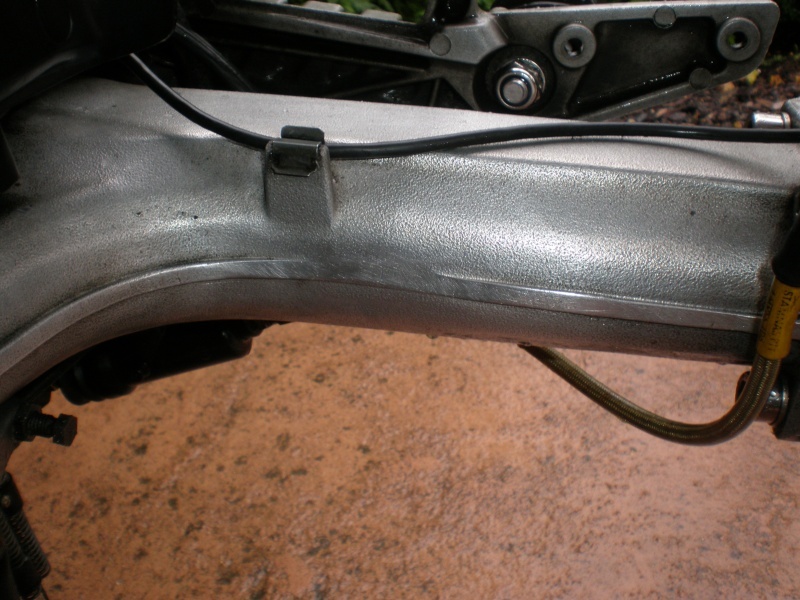 @JR_K100RS wrote: interesting that you filed off some of the rib on the monolever , I was thinking of doing the same , do you still need to take some off the left foot of the centre stand ? In a word, yes, and if you have a look back at this post you'll see that is just what I had to do - just off the inside of the left foot. But the other day I had an idea (watch out!) and added 5mm spacers to each of the four bolts under the centre stand's mounts against the gearbox and the stand is now a few more mm's away from the tyre - I reckon I'm gunna go up to 10mm as it's not hard to hoist 'er up on the stand. Filing away a few mm's from the rib on the swingarm wasn't necessary for tyre clearance really, and didn't or wouldn't weaken anything, but I like a bit of extra space in all things. The Supertrapp and (RJTRucker's) headers are my next project. today marks its application to "gerty"
Thanks for taking the time to document this properly mate! Cleared up a lot of the misinformation that is out there with this conversion. Bike is looking fantastic! Whilst riding in to work this AM under heavy rain and very leaden skies, I was wondering if Charlie jumped on ol' Gerty and test rode his new back sneaker. There's standing water everywhere and plenty of puddles to jump into. Oh, the joy of a boy with a new toy! As GiTH said to me when I got my new pirelli's..."Take it easy on those new skins" Charlie, especially if it's raining. Looking forward to hearing the reports of the roadtest. Chazza wuz jest here at work showing his new large rear tyre round the place after a wet morning splash over Mt Tamborine. The Cheshire Cat grin stayed on his face for the duration. It looks (and does) the biz. We snapped a photo of the two phat tyred girls, his and mine, framed by palmtrees in the warm Queensland rain...(which he might post before I get to it). "Phat tyred girls you make the rockin world go round!" with known issues and preventative action being planned , it has all come together rather nicely . Looking great Charlie, must feel better with that new rear tyre on. Job well done mate. thats real inspirational work there charlie. beautiful. i notice the rear 160 is smaller than the 130, dropin from 90% to 55% you wont pick it up on the gauges but maybe via satnav, how muck speed do you reccon you lost, maybe 2, or 3 clicks at the posted speed???? ?Not being nasty, just thinking. If your speedo ran you proud before it might run you clean now?? You know 2 or 3 kays under what you did before. the new fella measures about 2050 mm which isnt that much different , i guess about 2 percent difference , but still significnt as you say .i could put the sums into the calculator for the speedo calibrator software " karumba " and adjust the speed reading , but im happy that its remeberable at least ...well for the moment . but your right the difference looks to be much bigger.....i was surprised . i guess to get another perspective it might be advantageous to ask "what is your current rear wheels circumference and tyre dimensions " and get a better view of results ? maybe i should ask this in a new post ? whatcha recon ? When I did my tyre upgrade I'd been using a 140/80- and went to the 160/60-. 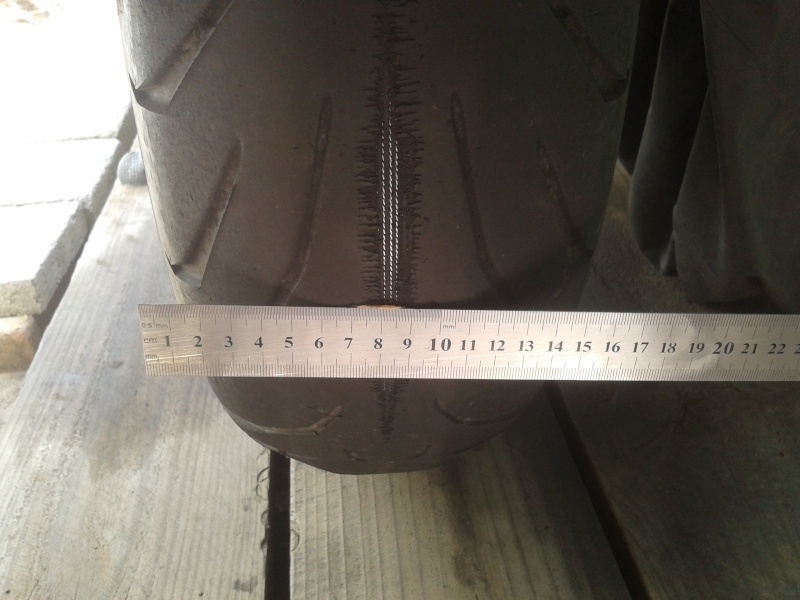 The previous tyre size had been calculated and the speedo dashpot inside the instruments adjusted previously using Karamba. So I whacked Karamba onto the new set up and was surprised to hardly notice a difference at any given speed, to barely rate a mention. 100 km/h indicated was 4,000 rpm. Now it's a needle's width different. So I didn't bother adjusting it. No speed camera citations or radar awards have come way my thus far in the nine or so months and 18,000 kilometres I've covered - a safety margin of error. It ain't out as much as one would think. remember to factor in that the RT/LT have a numerically higher final drive ratio than an RS so my bike is gunna rev lower at any given speed than yours. I've whacked the new Continental Road Attack II multi-compound radials onto my bike, along with a new rear Grimeca brake disc and Icer pads from the Boys at the 'Bins. In an hour or so when the motorbike workshop closes I will roll out onto the motorway and take a 70 kilometre spin towards my weekend home to see how they feel. The rear tyre isn't as wide at the edge as the Pirelli Angel ST, so there's a few more mm's of clearance at the swingarm and the exhaust side has more than a thin fingers' worth of clearance too. 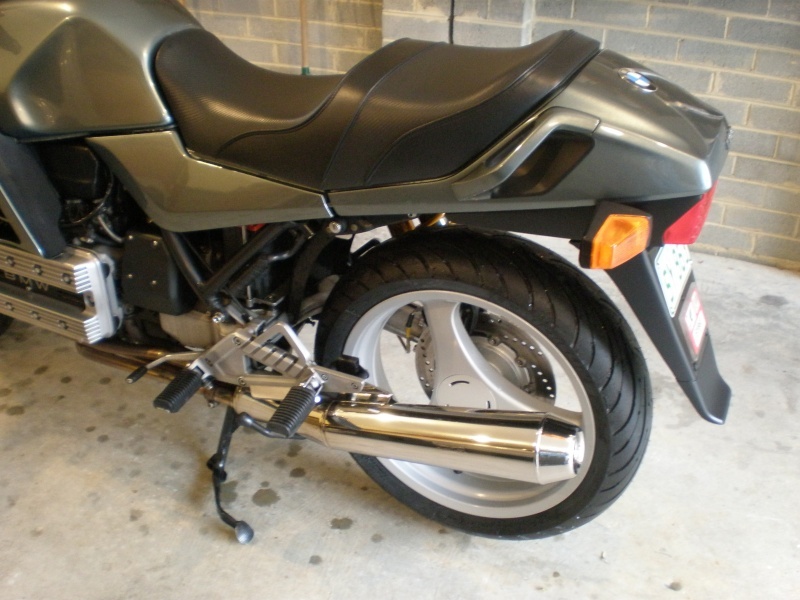 In the can't-leave-well-enough-alone department, I've just whizzed the old, worn tyre off a 17" front three spoke wheel from a K1100RS so I can run the larger 305mm floating discs and a 120/70ZR17 tyre...imagine the tyre choices then! A full road test will follow tomorrow from places with joyous names and equally joyous road surfaces like Mt Glorious, Mt Mee and Mt Nebo, near Brisbane and the foothills. The weather's looking good (mid-20s, no wind and sunny!). Pictures and observations tomorrow. Full moon tomorrow night too. looks like lots grip is there ....and the finish of the tyre is like shark skin ....is that pre run in ? My first impression of the new tyres came to me because of the several small local neighbourhood roundabouts I must traverse before entering a major road then the motorway. I'm leaning this way and that, slowing, stopping, accelerating, then leaning again. I noticed how light it felt with the new tyres, how the steering didn't feel stable, almost tracking in a 'skittish' manner, not planted like the Pirellis felt. It took me only a nanosecond to remember that the back Pirelli has flattened off considerably over 18000 kilometres, and I had got used to it riding every single day. These new Contis twitched and squirmed and were not confidence inspiring. So I gave it some stick and hit the motorway's heavy weekend arvo traffic towards the city and settled into a 110-120 kph thrum. In twenty or so kms I forgot about it. Changing lanes became a no brainer, a quick turn of the head, a flash or two of the indicator, a mere thought of being in the next lane, and I was. Cool! I can get used to this feeling. The new Continentals have this skin on them from new that they're marketing as 'Black Chili' and it's supposed to be a non-skid coating that wears off as the tyres accumulate a hunnerd or so kms. You know that greasy feeling you get on a brand new set of sneakers!? On the Contis it isn't there, as their marketing geniuses suggest, or so we imagine. It's what Charlie referred to as feeling like shark skin. Could be snake oil. It's all the same. Too early to say if it's all you beaut. Pictures and a ride report from the twisties, tomorrow. um ...shouldnt the diff be 2.91 for the rt .....2.81 is for the rs ? Chazza and I rode out to the hills to do some seat-of-the-pants testing of the new tyres in their preferred environment: twisty roads. I still felt that mild wander so we stopped at the local BP servo to air the tyres up a bit from their initial installation setting of 35 psi front and 39 psi rear - lower than I usually run them. I pumped the front up to 40 psi, the rear to 42 psi. That immediately settled them into a groove. I prefer a harder tyre and firm suspension settings. I like the feedback it gives me. The Contis definitely feel lighter in the front than the Pirellis. It took me a little while today to get used to it. 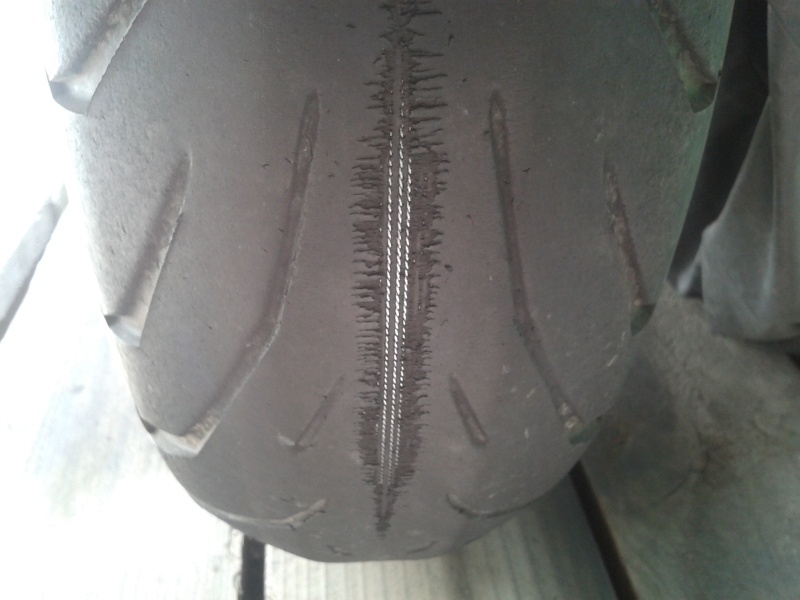 The back tyre has settled in, I felt pretty good with it straight away, and the barely 5mm-wide chicken strips left are testament to how well it tipped in. Overall the bike is more stable, tracks well, and tips in smoothly. I will have to get used to the easier steering. But I like the feel it has. The roads we rode are fairly smooth surfaces that undulate and climb, lots of decreasing radius turns, mostly 60 - 80 kph limits with a few 100 kph straights. An ideal place to get a tyre to its edge, to test its (and the riders') limits. Now let's see if we can get 18000 kms out of the Continental Road Attack II's rear multi-compound rubber formula, as we did on the Pirelli Angel ST.
A late Autumn tour down to Victoria to see my Mum in a coupla weeks' time will highlight their potential longevity. Did I mention the weather was brilliant!? It got up to about 25c and did I see any clouds in the blue sky? charlie yep 2.91 is right I knew that, but I never let the facts get in the way of what I'm thinking. so 2.91 from a 2050 tyre is 3950rpm. Well never mind 2050 verses 2095 is only 10 1/4 metres over the 100 clicks if it was a bike race it would be 4 bike lengths. If the cops arnt lookin then its a bike race right. Crikey Charlie - were you getting the knee down? After this weekend's spirited riding with Charlie and the usual Tuesday morning commute to work I can say that I still find the Contis not as straight-line stable nor as planted as the Pirellis, but am really enjoying the light steering feel. It's like what a shorter wheelbase motorbike feels like, the Mighty K being a bit of a large barge in that regard. They roll smoothly, due in part to careful balancing on the high speed spinner. Lane changes on the motorway, roundabouts, suburban streets and country roads, all feel better under me now. 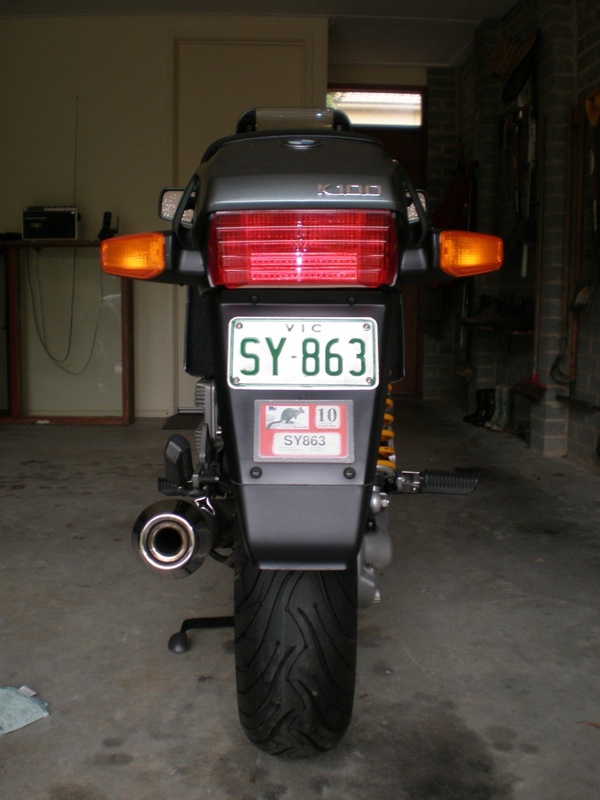 I've not got a picture for proof like Charlie but the chook strips on the back tyre are narrow and hero-like. I am glad to have the chance to try them but there's a spare pair of Pirellis waiting in the garage for when these Contis wear out, or if the winds change direction. Gith great stuff you say when the contis wear out any guess on a kilometre figure for that event???? such grip must come via distance yes???? I got 18000 kms out of the back Pirelli before it flattened off to the point of feeling a bit heavy in turns during the transition to lean, but the front looked good for another 3 - 4000 kms. The Contis are advertised as having a cured compound that goes from a harder centre to a softer edge, but without the hidden 'seam' in the rubber compound common on many other brands. As for mileage, all I can say is we shall see. This morning's commute was a quick dash through many decent curves and me likey the way they handle! just an update to this thread to clarify some of the differences that one can expect when fitting up some radials on large rims to "the old girls "
Well it looks like there are now 3 phat tyred ladies , I've finally completed the upgrade after the old rear Avon Azaro killed itself ( delaminated tread ) . Following TWB's experience & directions I shaved the rib on the monolever , removed the 2mm wheel spacer & also modified the left foot of the K1100 centre stand , the stand mod included grinding the inside edge off , welding up the hole , increasing the left foot on the outside by the same amount I took off on the inside , all in all pretty easy to do , I've decided to go with Michelin Road Pilot 3's front & rear , 110/80/18 front & 160/60/18 rear , clearance wise , plenty of room to the exhaust , >15mm , tyre to monolever approx 4mm , tyre to left foot of centre stand with bike off centre stand but no rider is approx 6mm , with rider this gap increases . its a lot of tyre eh ? JR, I'm in the process of the 3-spoke mod on my 85RT, although using the narrower rim in the rear. I'll be using a Supertrap tuned exhaust and muffler, and can't tell just yet what the final solution will be. It's not clear to how your stand(s) rest whilst in motion as the pictures are all with the bike on the center stand. 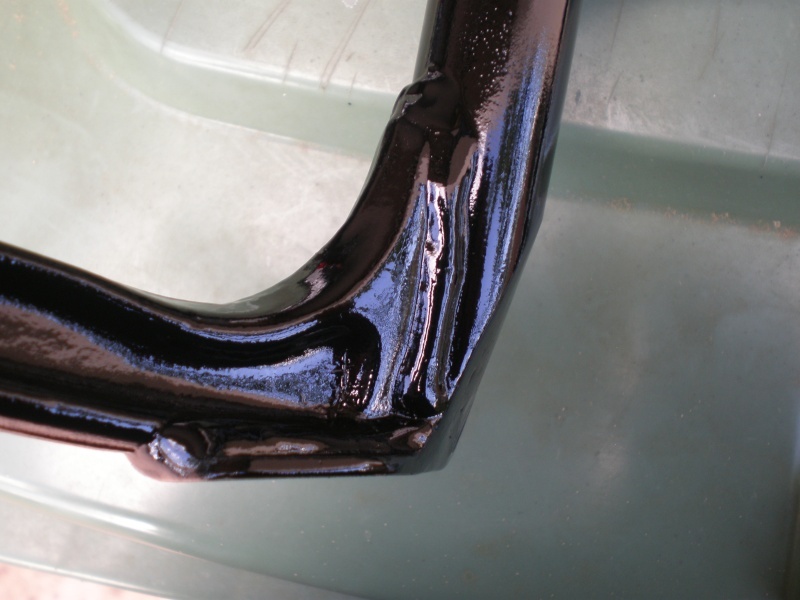 Looks like a Staytune muffler (and I can't tell if the headers are stock). Seems we have now three (3) methods of modification, yours, Charlie's, and TWB. Although its not entirely clear as to why, on Big Red it appears the stand(s) rest at a lower angle while in motion to avoid the tire entirely, thus obviating any need for modifications to the center stand (am I right?). Meanwhile, you and Charlie seem to prefer the stand(s) rest more in the stock configuration, that is, at a higher angle. JR, your bike looks very nice indeed. It just needs an RS belly-pan and it will be a stunner. Thanks for the picture, it makes it clear. I've already changed-over to the K1100 stand, which I like better than the old. So, my goal is to upgrade the bike with radial tires, and for those reading this, it wasn't clear at first if the newer stand was required. 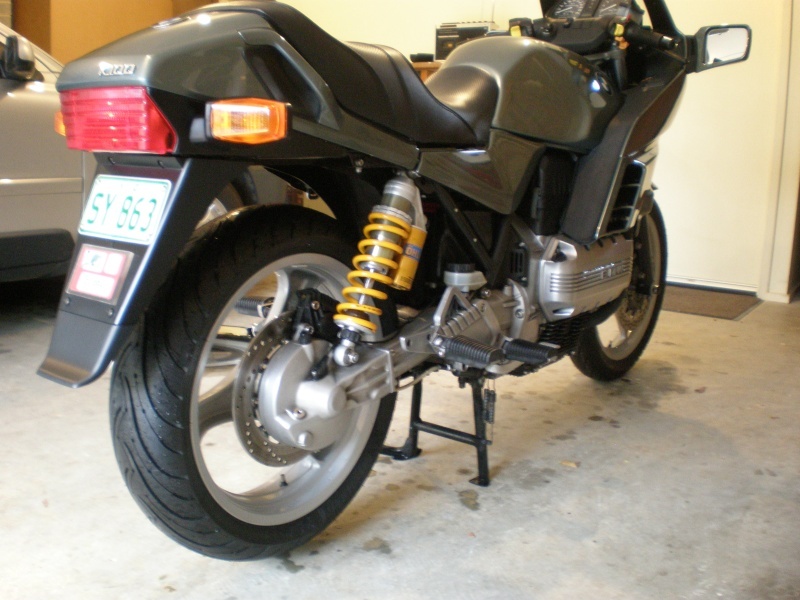 My next step is to install the custom exhaust, and that gets tricky because I cannot use the stock bracket that holds the center stand at rest when the bike is in motion. Fortunately, I've done bracket design in my former career, so this should be interesting and fun. Have a great summer's ride there down-under. I've finally had a chance to have a squiz at your postings to this thread, JR, and have to say that the mods we've done look really good, but especially on your bike. I like the silver wheels on your bike. I didn't bother re-painting my stands after the mods. You've done a bonzer job! I can't wait to get my hands on my Mighty K again. She's tucked up in a shed in Queensland for the next year. Maybe if I stay here I'll ship her over. One can never have too many motorbikes to choose from in the garage. I've got Michelin Pilot Road IIIs on my R1150RT and can confirm that they are the best wet weather tyre I have ever ridden on. I'm up to over 16,000 MILES on the front and plenty of tread to go! The back lasted about 10,500 miles. I might use them on the K at some stage. Am currently using Conti Road Attack IIs on the K.
good to hear you have kept the K , stay warm ! a few folks have been amazed that the old bevel drive ( with the 4.5 inch rear rim ) and the some what 14 mm offset ( to the left ) would surely recentre the running line on the tyre , and that they would fall into corners better one way than another . having at last worn through to the "canvas " I can say that no such thing occurs ....they run amazingly well for the setup ...although you will notice a slight difference when changing over .